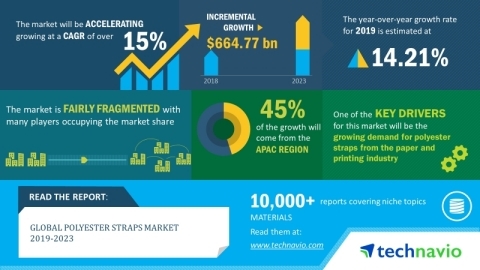 LONDON--(BUSINESS WIRE)--The global polyester straps market is expected to post a CAGR of over 15% during the period 2019-2023, according to the latest market research report by Technavio. Polyester straps are extensively used in building and packaging various paper and printing products such as writing and printing paper, tissue papers, coated papers, and specialty papers. This is mainly because polyester straps are lightweight and resistant to corrosion, and they ensure safe transportation and storage. The consumption of tissue paper is increasing owing to the growing focus on hygiene. Further, the demand for printing and writing papers that are used for magazines, books, stationery, newspapers, and catalog printing is also increasing considerably. Such growth in the paper and printing industry will fuel the demand for polyester straps during the forecast period. As per Technavio, growth in the e-commerce industry will have a positive impact on the market and contribute to its growth significantly over the forecast period. This global polyester straps market 2019-2023 research report also analyzes other important trends and market drivers that will affect market growth over 2019-2023. The global e-commerce market is growing at a rapid pace with an increasing number of consumers switching from traditional shopping methods to online shopping. The use of e-commerce to distribute products has helped manufacturers to reduce transaction costs, improved inventory management, increased productivity, and quickened the purchase process. Online retailers use different types of corrugated boxes based on the products being transported to ensure the safety of the products. Polyester straps are commonly used to bind corrugated boxes to secure them and eliminate the risk of spillage. With effective packaging becoming one of the key business requirements in the e-commerce sector, the polyester straps market will grow considerably during the forecast period. “The use of steel and metal products is growing exponentially in several industries including construction, automotive, and infrastructure. The growing use of metal and steel products will also drive the demand for polyester straps that are used in palletizing, tying, and packaging steel products as they are very strong and durable. Thus, the growth in the steel and metal industry will fuel the growth of the polyester straps market during the forecast period,” says a senior analyst at Technavio. This market research report segments the global polyester straps market by grade (machine grade and hand grade) and geographic regions (APAC, Europe, MEA, North America, and South America). The machine grade segment held the largest polyester straps market share in 2018. Machine-grade polyester straps are commonly used with strapping machines and widely preferred in industrial packaging operations. This is due to their high strength, tension, and stretch qualities. The superior impact and weather-resistant properties of machine-grade polyester straps increase their preference in sectors such as the automotive industry. The APAC region led the market in 2018 with a market share of more than 42%, followed by North America, Europe, South America, and MEA respectively. The growth of the polyester straps market in APAC can be attributed to the increasing industrialization and strong demand for polyester straps from industries such as paper and printing, and metal and steel.